Naturally I think about my late mother every Mother’s Day. This year on Mother’s Day, in addition to thinking about Mom, I’ve been working on a new book collecting men’s adventure magazine stories and artwork that’s set for release next month. As I scanned one of the classic MAM covers that will be included in it—a gonzo image of a man being attacked by a horde of big, red coconut crabs— it got me thinking about another Mother: Frank Zappa, the creator and guiding light of the avant-garde rock band The Mothers of Invention. I became an instant fan of Frank and the Mothers in 1966, when they released their first album FREAK OUT! in 1966. I bought most of the albums they released in the ‘60s and ‘70s. Then I rebought them on CD years later. About ten years ago, I bought a new CD edition of their album WEASELS RIPPED MY FLESH. It sparked a flashback to the day in 1970 when I bought that album at the Pearl Alley Discs record shop in Columbus, Ohio, near the Ohio State University campus where I was going to school. I remembered thinking the LP’s title was a hoot. And, I loved the bizarre cover art – a retro-style cartoon. It shows a vacantly smiling square guy shaving with an, um, electric weasel. The weasel’s teeth are making a bloody gouge in his cheek. Wild! While I refamiliarized myself with the album by listening to the CD, I decided to search the internet to read some background info on the original album. From various websites, I learned that Zappa got the album title from a story in one of those magazines: the September 1956 issue of MAN’S LIFE. I found a picture of that issue’s cover online. It features an incredible painted illustration that’s even more bizarre than the album artwork. The MAN’S LIFE cover painting (which I later learned was done by one of the great illustration artists who worked for the genre, Wil Hulsey) shows a bare-chested, bleeding, manly man waist-deep in churning water, desperately fighting off a horde of attacking weasels! Several Zappa fan sites explained that Frank Zappa owned a copy of that issue and loved the story title. But he decided not to use the Wil Hulsey painting for the cover of the album he named after it. Instead, he showed a copy of the issue to a hip young illustration artist who called himself Neon Park. (His birth name was Martin Muller). Park had recently done cover paintings for several rock albums and Zappa liked his work. I assume that by “worse” Zappa meant something even more over-the-top than the OTT scene on the cover of the September 1956 issue of MAN’S LIFE. Neon Park came up with his own WTF image for the album cover. It was inspired by a black-and-white Schick Razor ad he saw in the October 3, 1953 issue of the SATURDAY EVENING POST that shows a guy happily shaving with his Schick. Park painted a cartoony version of the guy in the ad holding what appears to be an, uh, electric weasel. The weasel’s teeth are ripping a bloody gouge in the guy’s cheek. But he’s smiling blissfully. A word balloon next to his head says “RZZZZZ!” Another shows the name of the album, which became far better known than the music in it. After reading about all that, I tracked down a copy of MAN’S LIFE, September 1956 on eBay, bought it (for over $200) and read it. 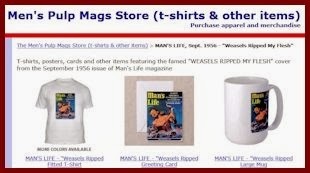 Neither the magazine nor the “WEASELS RIPPED MY FLESH!” story were what I expected. I had grown up during the decades when men’s adventure magazines were sold on newsstands and sitting on tables at local barber shops, but I hadn’t paid much attention to them and had never read any. When I read MAN’S LIFE, September 1956, I was fascinated by everything about it: the fiction stories, the supposedly true non-fiction stories, the exposés, the ads, even the letters to the editor. I especially loved the killer weasels story, which is dark, noirish and as amazingly wild and cool as Wil Hulsey’s cover painting. 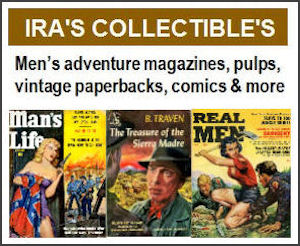 ● MEN’S ADVENTURE MAGAZINES: IN POSTWAR AMERICA by Max Allan Collins and George Hagenauer (which features the awesome collection of magazines and original artwork owned by Rich Oberg). 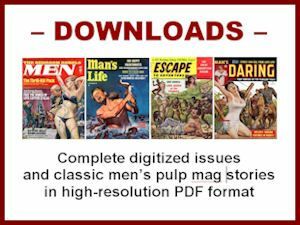 I also started searching for blogs or websites dedicated to discussions of the men’s postwar pulp magazines. 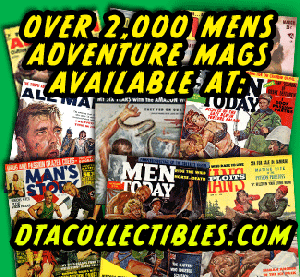 I did find scattered posts about men’s adventure magazines on a number of blogs and websites. I found men’s adventure magazine cover scans on various types of sites. 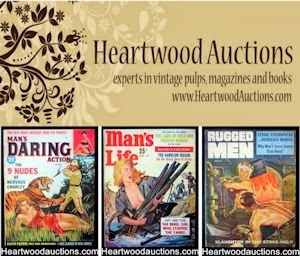 I also found blogs that focus on the history of related but different genres, like the earlier pulp fiction magazines that ran from the 1920s to the early 1950s and the men's “girlie” or bachelor magazines of the 1950s, 1960s and 1970s. What I didn't find was what I really wanted – a site that focuses on the post-WWII men’s adventure magazines and the various aspects of the genre: the covers, the artists and writers, the pulp-fiction style stories and “true” non-fiction articles (which tend to severely bend the meaning of the word “true”), the vintage ads, and the other interesting and amusing things those magazines tell us about the men, women, history and culture of the ‘50s, ‘60s and ‘70s. I couldn’t find any site like that. So, in 2009, I decided to create one myself. You’re reading it now: MensPulpMags.com. A couple years later, I created the Men’s Adventure Magazines Facebook Group, which now has thousands of members from around the world. In 2012, I decided to put together a book collecting some of my favorite men’s adventure magazine stories. It was published in January 2013 by New Texture Books and is available on Amazon.com or directly from me on eBay. My co-editors on the WEASELS anthology were writer/publisher Wyatt Doyle, head of New Texture, and writer/musician Josh Alan Friedman, whose father Bruce Jay Friedman was an editor of men’s adventure magazines before he became a world-famous novelist, playwright and screenwriter. That book includes the original MAN’S LIFE story about flesh-ripping weasels and many other wild stories by notable writers who once wrote for men’s adventure magazines, such as Bruce, Lawrence Block, Jane Dolinger, Harlan Ellison, Walter Kaylin, Ken Krippene, Robert Silverberg and Walter Wager. There’s also an interview Josh did with Mario Puzo, author of THE GODFATHER, about his time as a writer and Associate Editor for men’s adventure magazines. Our WEASELS RIPPED MY FLESH! anthology is illustrated with the covers and interior artwork that were used for the stories. Its success has since led Wyatt Doyle and I to publish a series of books that feature classic men’s adventure magazine stories and artwork. There are currently five books in the series, which we call the Men’s Adventure Library, and more coming. Our most recent books are lushly illustrated in full color and available on Amazon worldwide. We have many more planned in the years ahead. So, thanks to Frank Zappa for getting me hooked on men’s adventure magazines. And, Happy Mother’s Day to all of the various types of Mothers out there.